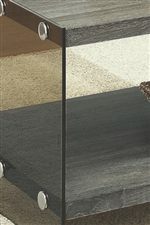 The 70196 Console Table w/ Glass Sides by Coaster at Standard Furniture in the Birmingham, Huntsville, Hoover, Decatur, Alabaster, Bessemer, AL area. Product availability may vary. Contact us for the most current availability on this product.